Rather than attempt a full blog-post this week, I will just link to one that I wrote for the College of Physicians of Philadelphia, that was posted online yesterday. On a couple of occasions in past blogs I have referred to the catalogue of an auction held in Leipzig in November 1912 by C.G. Boerner. As promised in last week's post, I am today sharing the first in a series of pages on which I will try to collect together dispersed leaves and cuttings, and also keep track up new discoveries. 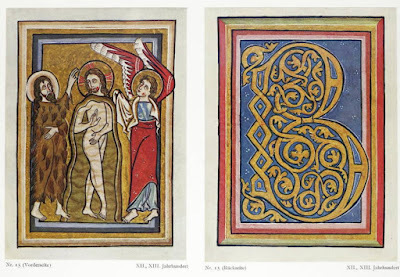 The first manuscript to be treated is a series of cuttings from a Gradual, presumably Cistercian, because several depict monks dressed in white. The unusual style -- which is not very refined, but is extremely appealing -- combines Netherlandish and Germanic features, suggesting the Lower Rhine; previous attributions include France, Flanders, Lake Constance, north-western Germany, and Cologne. 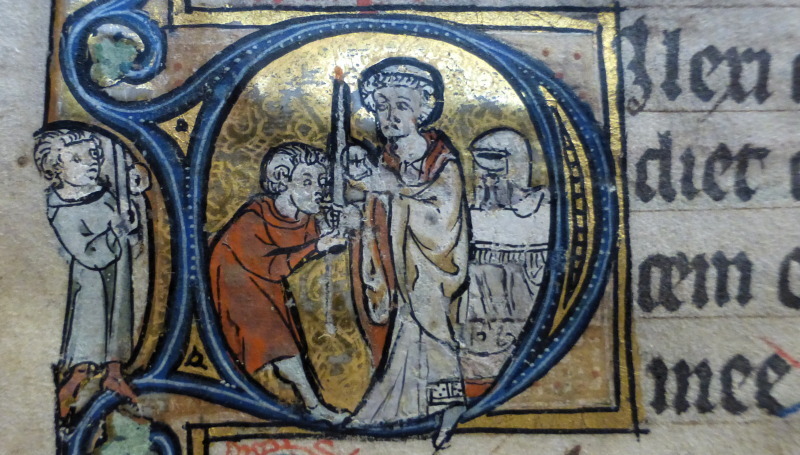 Dates from c.1300 to c.1350 have been proposed in the past. This link should take you to the new page, and you can find a link to the right, below the "Blog archive". Google's Blogspot blogging templates allow for rarely-changing content, such as an "About" or a "Contact" page. 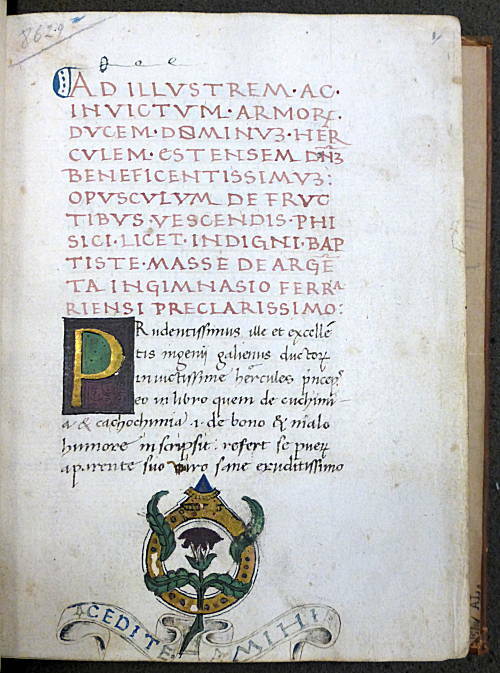 I plan to experiment by using such pages to keep track of identified leaves and cuttings from dismembered books. In the past I have given lists of such leaves in blog-posts (e.g. here and here) and then added a series of addenda, when I learn of new leaves. 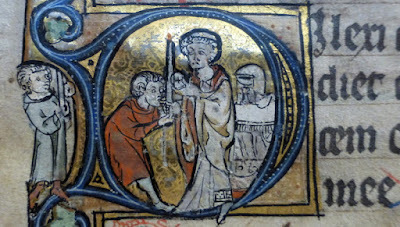 There are several dismembered books that I am actively working on as part of a catalogue of a private collection, and I hope that by making my lists available, it will encourage readers to send new information. To take one example, I currently know the whereabouts of only about a dozen of the 40-ish cuttings from the Burkhardt-Wildt Apocalypse, but I am sure that readers will know about others. 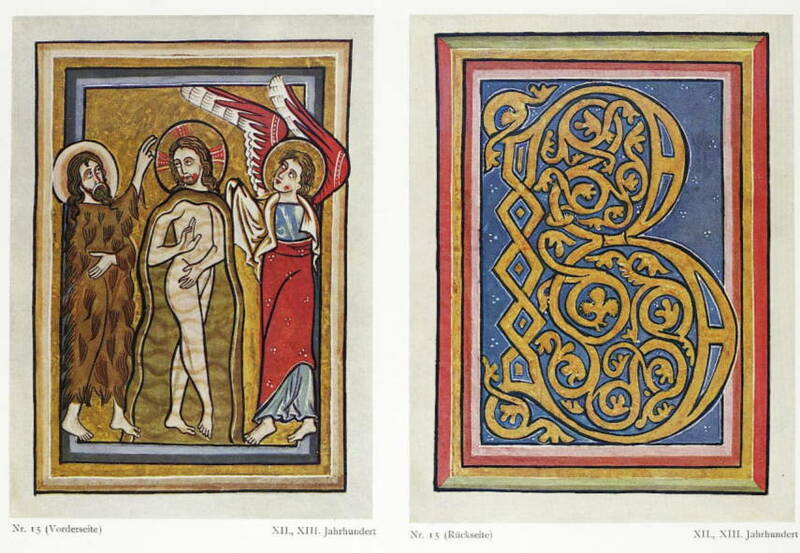 A few months ago I wrote a post about a leaf at Houghton Library, with a miniature of the Baptism of Christ on one side and a Beatus initial on the other, in which I identified it as one of the leaves sold anonymously by Gustav Nebehay at Sotheby's in 1926. "Sold at auction in Munich in 1912 to Edgar Huidekoper Wells (1875-1938), it was acquired by George J. Dyer for the Fogg Art Museum (1927.21) before being transferred to Houghton Library in 1990"
with a footnote detailing the 1912 auction: C.G. 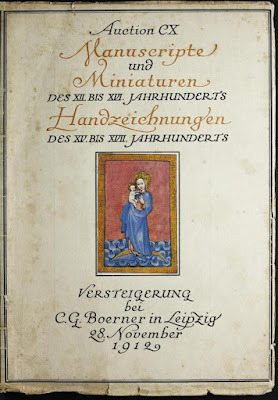 Boerner, Leipzig, Auction CX: Manuscripte und Miniaturen des XII. 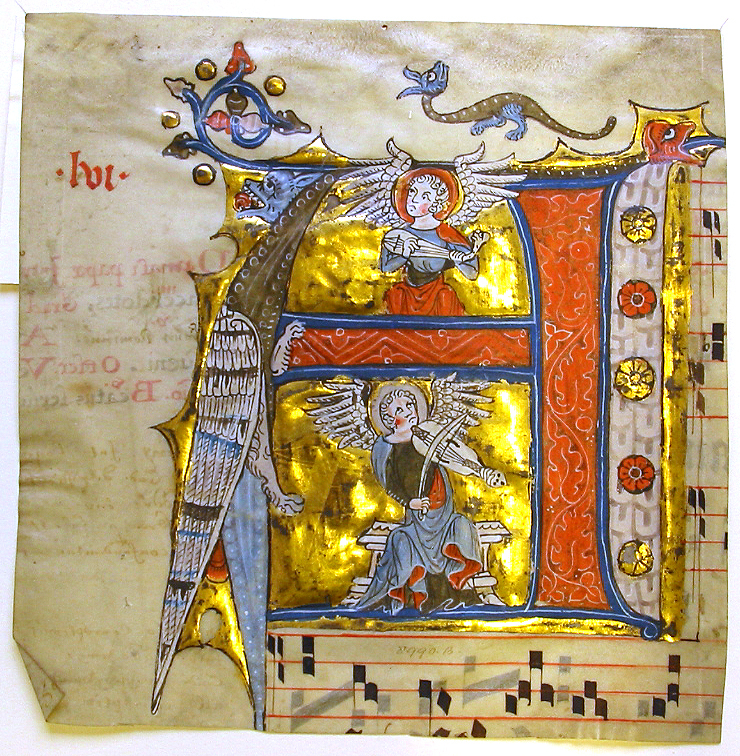 bis XVI. 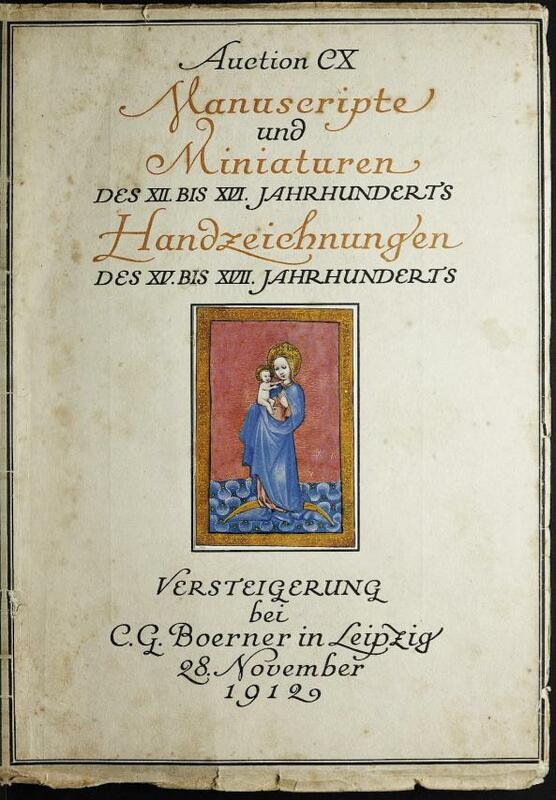 Jahrhunderts, Handzeichnungen des XV. bis XVII. Jahrhunderts, Versteigerung ... 28. November 1912, lot 15; the image above is taken from this catalogue.